Performance is all in the wear layer, especially when it comes to hardwood floors. Not only are they designed to resist scuffs and scratches, they clean up easily and continue to look beautiful thanks to high-tech wear layers that not only protect the wood underneath, but give them varying gloss levels to satisfy any style. Factory finished floors typically outperform site finished floors and are more durable -- it's hard to compete with a factory controlled environment, longer finishing times and the use of advanced materials that a manufacturer can bring to bear versus what an installer can provide on site. New advances in nanotechnology offer an increased level of protection. This is one of the most commonly used finishes because it is tough, durable, easy to clean and offers increased abrasion to make floors less slippery. Aluminum oxide is often added to urethane finishes which are cured by UV light, making them one of the toughest wear layers for hardwood flooring. Some floors, especially for those used in kitchens and other areas where they can be exposed to moisture, are impregnated with acrylic to prevent moisture from seeping into the core. Moisture and hardwood floors do not get along; this treatment prevents water seepage. Polyurethane is a common choice for on-site finished floors that are allowed to air dry. There are both water- and oil-based urethanes that are used as well. While these finishes are more than adequate for most residential settings, the fact is that they cannot outperform finishes that are applied in a controlled factory environment and are UV cured. One drawback is that any image that perforates the finish can be difficult to repair, often requiring the removal of an entire board or resurfacing the adjacent area to match. These offer a very beautiful look, but true oil finishes can be temperamental and require regular maintenance to prevent them from drying out. However, there are several companies that produce urethane coated floors that look just like oil finishes.While generally not as durable as a urethane finish, they do offer greater flexibility when it comes to repairs -- scratches can often be buffed away. 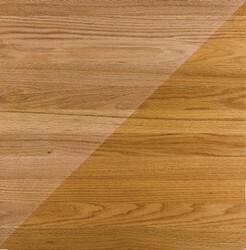 Red Oak: top section uses a water-based finish, bottom is an oil-based finish. Photo courtesy of the National Wood Flooring Association.